If you ever have had your clutch go bad on you , I do not have to go into too much detail as to what happens. that’s right your car will not move anymore! For those of you own a vehicle with a manual transmission and have had the misfortune to have this happen here is what a old and new clutch assembly looks like. The clutch assembly on the left is the old one , the disc is worn down to the rivets, and the pressure plate has hot spots on it. 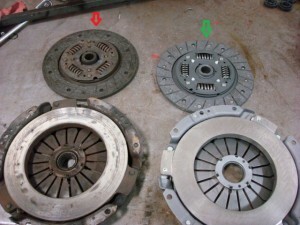 Here are some warning signs for you when your clutch is starting to fail. When you are going up hills you may notice your engine R.P.M increase but your vehicles speed does not. When you engage the clutch on take off you may start to feel a chatter or vibration in the steering wheel. 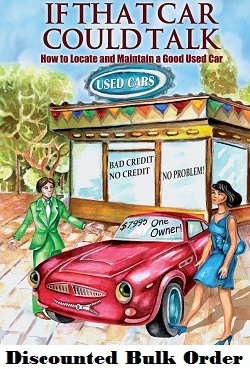 You will start to find it hard to shift into gear, and might have to double clutch. You may find it difficult to shift into reverse . If you experience any of these symptoms you should you should get your clutch checked, and or replaced . If you forcibly shift your transmission into gear you will cause transmission damage. « Question: Dan M. Asks, “Where is the air going in my tires” ?